90th Anniversary Celebration, May 4, 2014 Was a Great Success! Thank you for celebrating 90 years of Camp Kinderland with us on May 4, 2014. 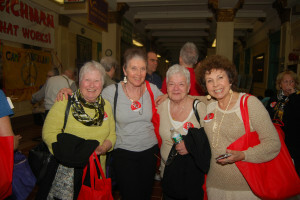 It was a huge success, with over 500 people reuniting, dancing, singing, eating, bidding on silent auction items, buying camp merchandise, and reminiscing at Julia Richman High School in NYC. It was certainly a day to remember, and we couldn’t have done it without you – our sponsors, our volunteers, our loyal Kinderland supporters. We have several hundred photos of this special day. Check them out! Keep an eye out for yourself, your family, your group-mates, your counselors, and your campers from years past! One of the very special parts of the day was a viewing of Generation to Generation: 90 Years of Camp Kinderland, an oral history video compilation of photos, CIT play clips, and interviews with current and former Kinderlanders recounting the 90-year history of our special summer camp with a conscience. View a short clip of the video here, and buy your very own copy of the full-length 67 minute film at the Camp Store. During the event, we gave out Kinderland tote bags and commemorative journals. If you missed the event, but want to remember this special milestone, buy your own tote and journal on our website! You can stock up on these and other Camp Kinderland items, such as water bottles, mugs, t-shirts, sweatshirts, onesies, bumper stickers, mural posters and notecards, and much more at our Camp Store. These things make great gifts for special occasions like birthdays, graduation, Mother’s and Father’s Day, and let you represent your favorite home away from home all year around. Jalopy Concert a Great Success! It was great seeing every one. The Jalopy concert raised $300.00 for Camp. Thanks to all those who came, and to the musicians. Woody Mann, Joel Itzkowitz, Rob Tenney, Lauren Brody. Ronnie Gluck, (what a great surprise ) Tim Kapeluck, Marty Cutler, Peter Brown, Gerry Tenney, Kenny Kosek, Leslie Tenney, Noah Tenney and Joel’s einikel. Camp Kinderland Alumni Blues Band. 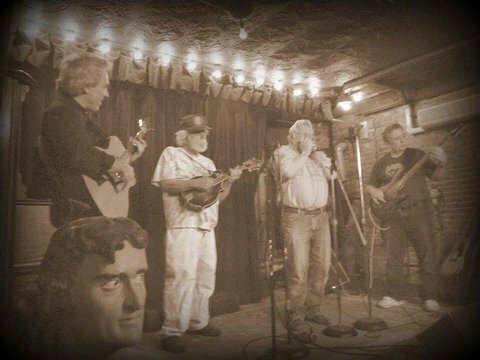 Only together for one song , Robert Johnson’s “Love In Vain” From left to right; Red Jeff, Mann the Man, Blues Boy Gershn, Harmonica Yussel and Bro Bobby Buck Biggs on Bass. Photo By Leslie Tenney . Fancy Shmacied by Gerry.